I’m writing to invite you to come on our newest and potentially most exciting and beautiful pilgrimage! We call it “In the Footsteps of Pope Benedict XVI,” and it will be from June 26 until July 6. We hope this pilgrimage will be an incredible experience of steeping ourselves in the life, thought and spirituality of this Pope, who has meant so much to all of us. Benedict was ordained a priest on June 29, 1951, at the age of 24, together with his older brother, Monsignor Georg Ratzinger, who is also still alive — they were both ordained at the same Mass. Their anniversary as priests will fall on June 29 — the 65th anniversary of Pope Benedict’s ordination to the priesthood. For this reason, the pilgrimage will begin in Rome. We will be in Rome for this important anniversary, which will also allow us to attend the great celebration of Feast of Saints Peter and Paul in St. Peter’s Square. The feast of these two patron saints of the Church of Rome is celebrated every year on June 29. During our three days in Rome, we will see some of the places which were most important to Pope Benedict, and even go inside the Vatican, as Rome is Benedict’s second home. He has lived in the city since 1981 — for 35 years. Though we hope to see Benedict and extend our greetings on the occasion of the anniversary of his ordination in person—and to receive his blessing in turn—it may not be possible. His health may be too fragile. If we do not see him, we will be able to send him word that we are in Rome to celebrate with him the anniversary of his ordination, and we are certain, at the very least, to receive a note of gratitude in response! Benedict was a somewhat “liberal” theologian originally, but he became more conservative after 1968. His prolific writings defend traditional Catholic doctrine and values. During his papacy, Benedict XVI advocated a return to Christian faith to counter the increased secularization of many Western countries. He has said that relativism’s denial of objective truth, and the denial of moral truths in particular, is the central problem of our time. He revived a number of traditions, including elevating the Tridentine Mass to a more prominent position. He loved music, especially Mozart, he promoted the use of Latin, and he reintroduced traditional papal garments, for which reason he was called “the pope of aesthetics.” He has been described as “the main intellectual force in the Church” during the past half-century. Though the readings I myself am choosing, we will be able to glimpse the essence of his thought. After we leave Rome we will go from his “second home” to his “first home”: Bavaria, in southern Germany. For six days we will visit the places where he was born, grew up, studied, preached and worked as a bishop. We will visit his birthplace (Marktl-am-Inn in southern Germany), the little towns he lived in as a boy when his father, who was a policeman, was forced to move house to take new postings—all in Bavaria (Traunstein, Tittmoning, Auschau)—and then the places he himself visited on pilgrimages with his mother, brother and sister, especially Altoetting, a Marian sanctuary that is one of the most beautiful places in the world, a place of peace and profound holiness. We will visit the church where he was ordained 65 years ago, and the places where he taught as a university theologian, in Regensburg and in Munich. In Regensburg, we are scheduled to meet with his brother, Monsignor Georg Ratzinger, and to talk with him about his younger brother the former Pope, and their life together over the decades — the two still spend several weeks each year together. In my opinion, there may be no better way to get to know the mind and heart of Pope Benedict than to join us on this pilgrimage. Please consider joining me on this very special pilgrimage “In the footsteps of Emeritus Pope Benedict XVI”. I sincerely hope you will join me on this profound spiritual journey. P.S. There are always many things we could do with our precious time, but this particular pilgrimage will be so extraordinary and so unique, you may regret choosing to miss this experience. It will only take 10 days, and yet it will bring the entire life and work, mind and heart, of Pope Benedict into focus. I do hope you will consider joining us! Our June 26 – July 6, 2016 pilgrimage to Rome and Germany is part of our premier line of Signature Pilgrimages — limiting the number of pilgrims to 15 for a peaceful and personal experience. 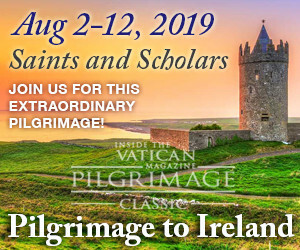 In addition, Dr. Robert Moynihan, Founder and Editor of Inside the Vatican magazine, and Deborah Tomlinson, Chief Operations Officer, will be traveling with the pilgrims for the entire pilgrimage. Bus and Transfers: Private, first-class motor coach bus and individual transfers from Rome’s airport (FCO) to the Hotel Michelangelo are included. Transfers from the hotel in Germany to Munich’s airport are not included. Meals: Breakfasts daily (9), nine (9) lunches, and seven (7) dinners are included. Basically, all meals are included. For the days when we are not including dinner, our lunches will be later in the day and the food will be abundant. We have found that most pilgrims prefer on these days, where lunch is a bit later, to have only one meal. All meals include water and wine, and in most situations you will order as you prefer — off the menu. Airfare: Airfare from Rome to Munich is included. Taxes and fees: All local taxes, porter fees and porter tips are included. Bus driver tip is not included. Entrance fees: All entrance fees are included. We will make every effort to adhere to the printed program and itinerary. On rare occasions, it may be necessary to adjust arrangements due to unforeseen circumstances beyond our control (including such circumstances as the weather, airline schedule changes, hotel requisitions, political disturbances, or transportation mechanical problems). Should such adjustment be necessary, a substitution will be made to the best of our abilities. 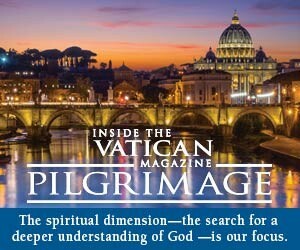 Join Inside the Vatican for this once-in-a-lifetime pilgrimage!